The history of the kilt goes back at least to the end of the sixteenth century, and perhaps still further (no one knows for certain). The word kilt comes from the Old Scots language, and its literal translation is,"to tuck up the clothes around the body". The Scots word is believed to be derived from the Old Norse word Kilting, taken from the Norse settlers who wore a similar pleated garment. The "Feileigh Mor" often referred to as "The great Kilt" was not tailored in any way, and only ever so slightly resembled the kilt we know and love today. It was made from two loom widths of material sewn together, giving a total width of approximately sixty inches. Its length about seven yards(six and a half meters), so as you can imagine it was a heavy garment. In order to dress in the great kilt required a bit of time (and perhaps help), as you would be required to lay the garment on the ground, having first laid your belt under it. You would then proceed to fold it into pleats, having done that you would then lie on it, wrap it around your body and secure it in place with your belt (quite a performance). Having done all that you would then arrange the upper part over your shoulder, tucking the remainder into your belt. The great kilt served more than one purpose, and was in fact very versatile. As well as providing great warmth in winter (if you have ever spent a winter in Scotland you know how important that is) it could also be worn very loosely in summer, thus keeping you cool. Sometime around the early seventeenth century the kilt more closely resembling our modern day version made its appearance. The philabeg often referred to as the "small kilt" or "walking kilt", became very popular throughout the Highlands and Northern Lowlands of Scotland. It was a smaller version not unlike the modern equivalent, and the first evidence of pleats being sewn in creating a tailored kilt comes in sixteen ninety two. This kilt is currently in the possession of the Scottish Tartans Society. The wearing of the kilt was outlawed in Scotland after the battle of Culloden. 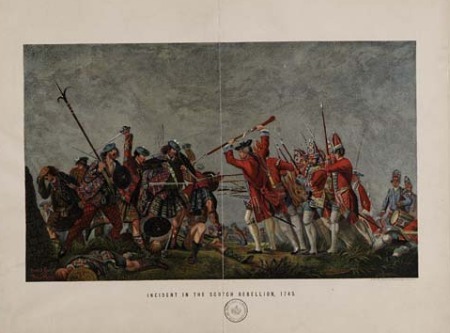 Below you can see a coloured image of a painting of the battle, showing the Hanoverian troops defeating the Scottish Highlanders. King George II imposed the "Dress Act" in seventeen forty six, this ban remained in force until seventeen eighty two. The history of the kilt then took a turn for the better. As some forty years later, a State visit to Scotland by King George IV saw the kilt becoming identified with the whole of Scotland, due no doubt to all the pageantry surrounding his visit. It was around that time that the Scottish clans were encouraged to identify themselves with specific tartans, and King George IV himself was seen wearing a spectacular kilt for the State Visit. 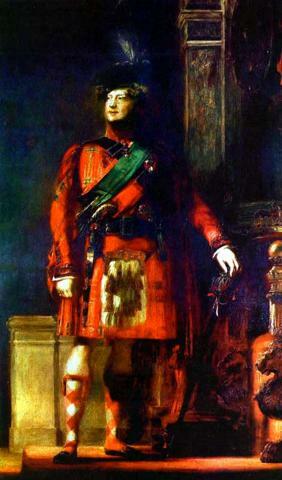 Below is a photograph of a portrait of King George IV which shows him resplendent in his kilt. His successor Queen Victoria who loved all things Scottish, did more than perhaps anybody else to re-establish the popularity of the kilt. And it was during her reign that the registration of clan tartans was established (she even dressed her boys in the kilt, which helped greatly to widen its appeal). So as you can see the kilt has come a long way, from its humble yet practical beginnings, to become the wonderful garment we all know today. It is then perhaps little wonder when you consider the proud history of the kilt, that it has become arguably the most famous National Dress in the world.